We ae the leading manufacturer and supplier of Self Regulating Heating Cable to our valuable clients. Owing to our expertise in the domain, we are involved in offering a wide range of Self Regulating Heating Cable. 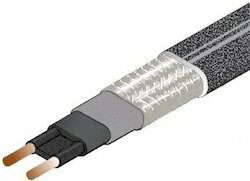 The provided cables are intricately manufactured with the aid of innovative techniques using the finest quality wires by our adept professionals. These cables are used to supply excellent power connections to various electronic devices. Moreover, these cables can be availed from us at the most nominal rates. Looking for Self Regulating Heating Cable ?